No matter to which industry or company you belong, leading others can be pretty much difficult, especially when you are not the boss! You not only have to encourage people to get the job done, but you also have to handle numerous responsibilities without having too much authority. The good thing however is that, an individual can become an excellent leader by acquiring suitable skills and behaviours. With these sets of attitudes, you can influence and persuade others in order to get the job done in your preferred way. 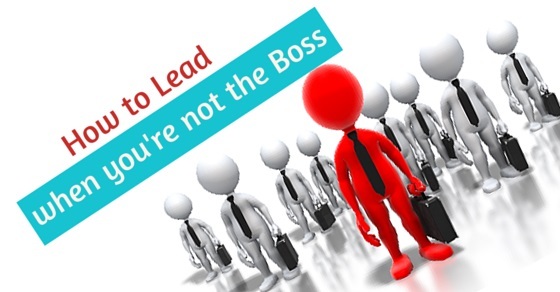 So, if you really want to learn the art of leading others, even when you are not the boss, then follow the below listed tips as it will surely help you. Leaders don’t protest behind closed doors. They don’t say ‘no’, when they have to say ‘yes’. They communicate what they exactly mean. So, foremost vital thing to become a leader is to advocate politely what you want other employees or peers to do. Becoming a true leader requires that you stand up for yourself politely. This of very important if you want to succeed as a leader, especially when you are not the boss. Learn to say ‘no’, in a polite manner, as and when required. If you need to do a favour then remember that you do so, only if it benefits you or the company. Don’t become a micro manager, this is because something that may seem ‘right’ to you, might be not much important for others. So, act flexibly and focus on end results only. Think over it, that whether this is a wrong way or simply a different way, and then take an action accordingly. Don’t step on others, but look for opportunities that can help you succeed forward. So, if one needs your support then be ready to deliver it, but make sure you do not support any wrong clause or fact. To become a leader you need to develop desirable characteristics within yourself. Every individual makes mistakes. If someone points your error, then instead of blaming or opposing it, admit it gently. Moreover, in a tough situation, you can ask for help or try fixing it on your own. Don’t panic as you will end up making more mistakes and this will make the entire situation worse. You may have great ideas, and you can’t wait to speak them out till it is your turn. But wait! Even others might have great ideas too. If you want to become a good leader, then learn the fact that good ideas may come from different sources as well. Do solicit ideas and listen to other’s ideas as it may help you learn even more. Failure is an imperative part of success. Evaluate a situation, and if you find that profits from it are more than the risks, then go for it. This is an important leadership trait. You can only decide between failure and winning, after overcoming the risks. Don‘t limit your networking to only finding jobs. Try connecting with people and build a strong network as this will develop your knowledge and interactive skills. This will also help you judge people. Also, if required, then help others in their careers as this is a sign of ability to guide and lead. There might be situations, when you have to get things done from your peers, without making them feel pressurized or tensed. In such cases, you need to act diplomatically and tactfully. So, if you want to win over others, then you need to stay alert and tactful during every situation. If you are working harder and smarter than others, then this does not mean that you will get any special treatment from others. You will achieve this only when you deserve. So, become a true leader and don’t ask for promotions or so, as this you can earn by being intelligent and awesome. Individuals accomplish most when they have a clear set of goals and aims in their mind. You need to know exactly, what you want to achieve. No matter what your position is, if you clearly draft your own objectives, then you can also lead others in achieving their goals. Effective leaders act only after evaluating things. If there is a meeting or so, then you need to go well prepared for it in advance. Lay out essential data, analyze the causes of a situation and levy actions based on this. So, before delivering an action, think over it systematically and intelligently. An excellently performing team supports the efforts of each and every member. As an effective team leader, you need to seek out the most optimal fits between tasks to be completed and interest of team members. List down chores, and match them up with sub groups or individuals. In case, one does not want to carry to a task, then look for ways to make that task more challenging or interesting. Make sure that you engage every member, so that they feel being part of the entire project. Learn from past projects and experiences. Regularly examine outcomes, both bad and good. Employ learned lessons to present situations, in order to make appropriate adjustments and secure optimal results from them. Even when you are not the boss, then you can deliver feedback to other group members. It’s true to some extent, that you cannot deliver any negative feedback, but surely you can appreciate them. Also, you can effectively coach people, both in formal and informal way. Whenever offering a suggestion, make sure you have a valid reason to support it. Mold, bend and adjust your style, to fit into someone else’s requirement. If you want someone to respond to you, then the best way is to customize your approach accordingly. If one wants you to send information, though mails then do so. Even if texting is more convenient, still make sure that you work in a way that other people like. Once, you are clear on what you want to achieve, and then state this to others as well. But, make sure that you allow others to do this according to their preferences. Don’t try to control the entire process, rather focus on end results and inform others that you want this to be done, no matter how they do it. Fill your end requirements with necessary details and let others chart a path according to their abilities. If you want to gain results from those, who don’t report to you, then the best way is to gain their trust. So, be friends with everyone as this is the easiest and the finest way to get things done from others, particularly when you are not the boss. Honour your commitments and be consistent as this will boost others confidence in you. Encourage and support group members during tough situations, as this is a sign of a good leader. Inspire others to accomplish their goals, but make sure that you do not do the entire work for them. Don’t try to control or act impatient. Relate with people on a personal level as this will help bring the vision alive to them. Try your best to utilize personal influence in order to acquire all that you desire. Since, you are not the boss, so it would not be viable if you take the entire success credit in your account only. Also, this can make you lose their commitment and they will avoid doing work for you in the future. These are behaviors that you can exhibit in order to lead, even when you are not the boss and generate an environment of connectivity and trust. So, act intelligent and adopt these behaviors fast. This is because with flat organizational hierarchy and strong span of control with leaders, leading others being a non-leader, is becoming critical day by day.